When the Prodigal Returns, Am I the Father or the Older Brother? In Luke 15:11-32, Jesus told the Parable of the Prodigal to rebuke the Pharisees and scribes for grumbling against Jesus who was eating with tax collectors and sinners. I recognize that in the context the prodigal represents the sinners, the older brother represents the scribes and Pharisees, and the Father represents Jesus or God. He was asking the scribes and Pharisees to rejoice that the sinners were coming to Him. They just couldn’t get it. However, as we apply this story to us today, I can’t help but ask when the prodigals come seeking help, how do I respond. Am I like the father or like the older brother? Keep in mind what is happening here. The prodigal son had made all kinds of mistakes. The prodigal’s demise was completely of his own making. He was in dire straits because he had done stupid and sinful things. He hadn’t lived right, but life treated him poorly. He hadn’t just been a victim of circumstance. In the story, notice that he didn’t actually come back to the father seeking forgiveness; he came back seeking help. He didn’t say, “Forgive me and accept me back as one of your sons.” He planned to say, “Father, I have sinned against heaven and before you. I am no longer worthy to be called your son. Treat me as one of your hired servants.” Why was he planning to say this? Because he was eating with the pigs and the hired servants in his father’s house were better off than he was. His father could help. However, he didn’t even get to finish his speech. The father was so excited that the son had realized his errors and was seeking him, he jumped in and said, “Bring quickly the best robe, and put it on him…” You know the rest. There was a fly in this ointment. The older brother got home and learned about the father’s compassion and mercy. He learned that the father hadn’t simply treated the prodigal like a servant but like a son. That “son of yours” didn’t deserve it. He had brought his misery on himself. He had made his mistakes. The older brother had never made mistakes. He hadn’t wasted his inheritance. He had always done just what the father asked. But the father hadn’t even given him a young goat. It would have been one thing if the younger son had lived like the older brother and life had just mistreated him. If he had ended up with the pigs through no fault of his own, the older brother could potentially see a reason for help. But this was ridiculous. It was perhaps even sinful. This was the wrong response. The right response was punishment. The right response was leaving him to suffer in the natural consequences of his own stupid, sinful mistakes. Sadly, the older brother was unable to see the grace of his father in his own life. He hadn’t recognized that the clothes on his back came from the father. He didn’t see that every meal he had eaten in that home had come from his father. All he could see was his work and how he had accomplished so much for the father. This celebration should have been his, not the prodigal’s. The father should have declared a feast for him because of his goodness, not a celebration of this prodigal’s profligacy. The father should have shouted from the highest rooftop, “Look at my older son. He is awesome. Look at how well he has managed his life in my service. Let’s have a feast for him.” It was a slap in the face to his good service to watch this younger brother be helped when he hadn’t been as wise as the older. Which shows another struggle. The older brother didn’t understand what the celebration was about. The feast was not a reward for the prodigal’s sins. It was a celebration of the prodigal’s return. 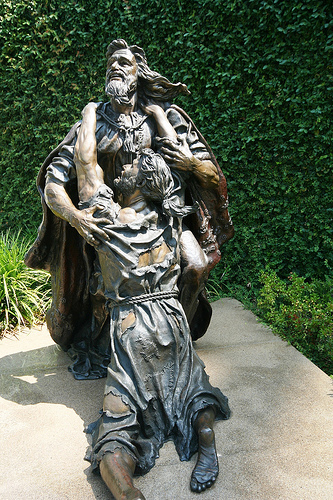 The prodigal recognized he had done something wrong and turned to the father for help. That should be celebrated. That should be met with mercy and compassion. But what about us? When prodigals seek help, how do we respond? Are we like the father, responding with compassion and mercy? Or are we like the older brother, responding with self-righteous indignation? When the drug addict comes forward for the 100th time, do we turn up our nose or are we willing to embrace him and compassionately help him in this decision to return to the Father? “Why do the elders keep putting up with that man? Haven’t they noticed me? I’ve never done drugs.” When someone’s child goes astray spiritually, are we willing to weep with the parents who weep or do we remain aloof asking, “What did they expect with the way they raised that child?” Do we think to ourselves, “Why does everyone rush around to support them? I’m the one who raised good kids”? When poor stewards of money come to say they are in dire straits and they need advice and help, do we embrace them for recognizing their problem and offer compassion or do we judge them saying, “You made your bed, go lie in it. Nobody ever gave me any handouts. I’m doing so well because I’ve worked at it”? Do we grumble, thinking, “It just isn’t fair. It’s all these people who mess up their lives that get help. Nobody ever helps me”? When the adulterer whose family is falling apart asks the congregation to pray for her, do we not only pray for her but with her or do we walk passed with eyes askance, avoiding her look because we just can’t understand how anyone could do such a thing and then have the nerve to ask us to pray for her. Do we think, “How dare she come here asking for this after what she’s done. She should be more like me. I’ve never committed adultery”? Of course, we are certain we are like the father because if folks from the world come to us with these awful stories but are willing to become a Christian, we race to them, embracing them, forgiving their past, and offering to help. However, keep in mind in the context of this story, the sinners and tax collectors were not “alien sinners” coming to God. They were children of the covenant who hadn’t kept the covenant. The Pharisees and scribes were lawyers of the covenant, spending their days and nights studying it to the nth degree. Yes, we’ll often be the father to folks from the world coming in, but what about to our younger or older brethren who have made different mistakes from us? Are we the father to them? Or are we the grumbling older brother, complaining, resting in self-righteousness? Finally, at the heart of this story is the fact that the older brother did not recognize his own prodigality. It is utterly ridiculous for him to claim, “I never disobeyed your command.” He may not have gone off into the far country. He may not have been as vile and rebellious as the prodigal. However, there is not a son alive and never has been (except Jesus) who never disobeyed his father. He didn’t realize how much he needed the father’s mercy and compassion himself. He thought he had earned what he had and that the father hadn’t actually given him what he deserved. Perhaps if we can all recognize how prodigal we’ve been, how much we need mercy and compassion, we’ll be more like the father to our brethren.